A visual comparison of the collection reveals stylistic differences between the French and English prints. By contrast, the English prints are more robustly drawn, detailed to a fault, and with an exaggerated, often vulgar humor. They presuppose a knowledge of political events and players, but not an elite education. In the French prints, facts are seemingly irrelevant, or at least take a back seat to the emotions being expressed. The English prints are reliably factual, and show a zest for politics, mirroring the great political debates of the time. The French prints are generally undated and anonymous, due to severe censorship, while the English ones are usually signed and dated. From the moment of Napoleon's coup d'état, he crystallized the hopes of both the royalists and the republicans. The royalists saw him as offering an assurance that the Bourbon monarchy would be restored. However, Napoleon quickly made it clear that was not his intention. At the same time, he distanced himself from his republican supporters in order to impose his own concept of power. He quickly moved to put a large number of newspapers out of publication, and censored those that were left—thus eliminating a key source of communication. Both constituencies eventually turned on him, using pictorial art as a means of expressing their opposition. Distribution of the prints was extremely dangerous and therefore limited until the waning of Napoleon's power following the disastrous Russian Campaign. 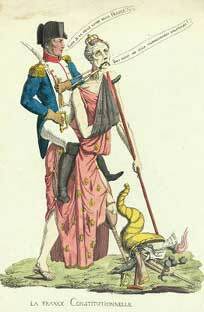 French cartoonists were well-educated, talented, and loyal to the ancient regime. The French captions are well-written, annotated with beautiful calligraphy, and full of allusions to classical mythology and historical events, literary quotations, and parodies of well-known painters. Some of the artists were known during their lifetimes, but many worked anonymously due to the great danger of publicly criticizing the Empire. Most publishers, too, distributed the prints clandestinely—no shop window showings occurred in France, or at least until after Napoleon's fall. 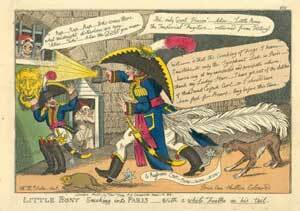 At the first hint of an anti-Napoleon print in circulation, Napoleon sent his secret police to root it out. 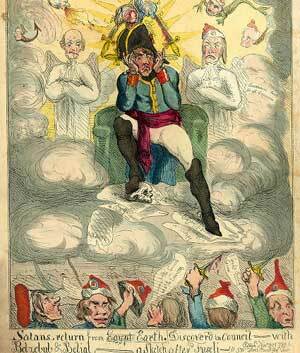 The cartoonists wanted to destroy the sacred aura that Napoleon and his propaganda machine worked so hard to establish. Official art put forward a timeless image in the style of classical heroes, sometimes going so far as to portray Napoleon in Caesar-like costume. Some of the prints, like this one, ridicule that image. 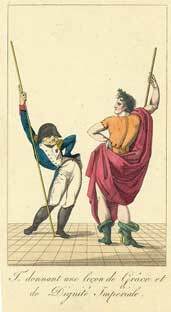 Talma, the figure shown with Napoleon, was an actor known for his success in Greek theater; the artist suggests that Napoleon needs lessons in how to act like an emperor. 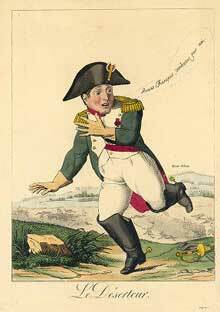 Since Napoleon drew much of his reputation from his military prowess, many cartoons from the last few years of his reign attacked that reputation, depicting him as a coward. During the debacle of Waterloo, Napoleon fled the battle field, ostensibly to return to Paris to organize its defense. This was a disastrous move. 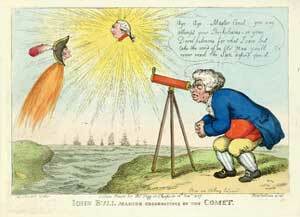 Afterwards, the Royalists wanted to make sure he was discredited for his, and used caricatures such as this to stress his flight from the battle and his propensity to have others sacrifice themselves for him. 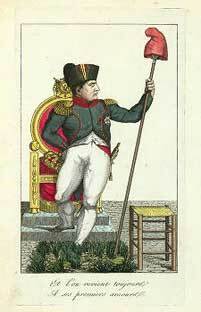 The royalist artists also continued to remind the bourgeoisie of Napoleon's link to the revolutionaries, using prints such as this one that proclaims that “one always returns to one's first love”. The bourgeoisie was terrified that a change in regime would lead to a replay of the chaos of the Terror, and the artists played on this fear to pave the way for the return of the monarchy. Finally, they tried to show that the promises of “peace and prosperity” under the Empire were unattainable, and that Napoleon's continuing reign was causing great harm to France, her people, and her economy. 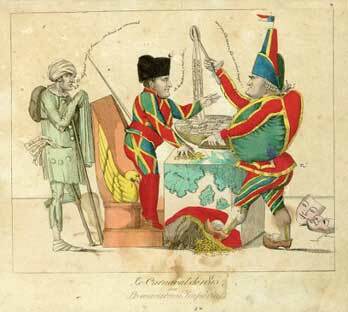 In “Le Carnaval de 1815” , Napoleon was again shown as Harlequin, and his chief aide Cambacérès as Pulcinella (both comic figures from the Commedia dell'Arte.) The strands of macaroni represent the many conscriptions that were necessary to replenish Napoleon's armies, and the bags of money show the resources that continued to be expended on the constant state of war. 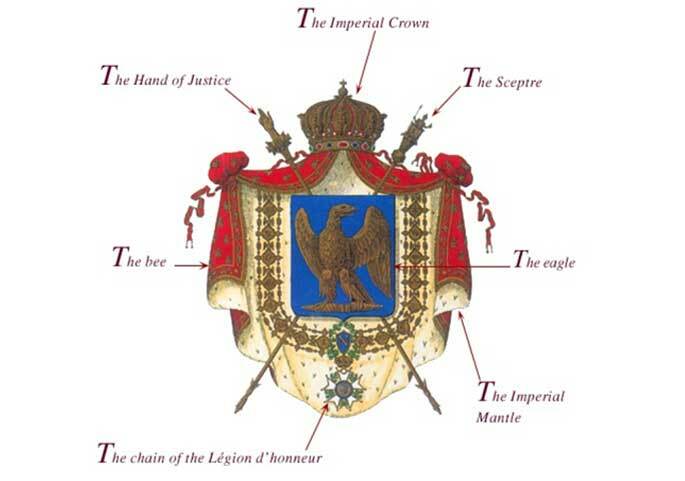 The eagle was a symbol of imperial Rome, associated with military victory. It was found atop every flagpole in Napoleon's France. The bee was considered the oldest emblem of the sovereigns of France. 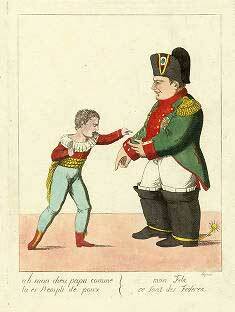 It was co-opted by Napoleon as an attempt to establish his legitimacy as ruler. More widely, the bee was viewed as a symbol of immortality and resurrection. The scepter, the baton of command and sign of sovereign authority, originated with Charlemagne and includes a statuette of the first Emperor of the West . The imperial mantle (cape) was made of scarlet velvet spread with bees and bordered with grape clusters. The cape was lined with ermine and held in place by the crown made of eagles with raised wings alternating with arcs, the whole topped with a globe bearing a cross. The chain of the Legion of Honor is another honor stolen from ancient Rome and reserved for the Emperor, his family, and other grand dignitaries. After Napoleon's exile to Elba, one last symbol came into existence: the violet, which was used to symbolize hope among his followers that he would return to rule. The English prints are quite different in style, in motivation, and in content from those done by French artists. One notable difference is their propensity to ridicule his appearance, especially his size (which was not particularly small for his nationality and time). The more he threatened British and Russian interests, the greater the graphic indignities to which he was subjected, including, according to George, being “grilled and pitchforked, booted around, farted on, frozen, eaten alive by lions, bears, ogres and Cossacks.” He shrank in size, from dwarf to imp, until he was almost snuffed out by his enormous plumed hat. 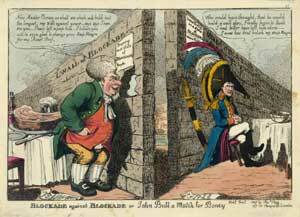 The English caricatures were generally published as a swift response to actual events, such as the Treaty of Tilsit or the Blockades of the 1806/07. They always portray Napoleon in his role as military commander, never as emperor since they did not recognize his claim as a legitimate ruler of France. As you review the evolution of caricatures within the collection, you will note the development of John Bull as a symbol of the “typical” Englishman who bears the burdens of the political and military decisions of the British government. He starts out as an unsophisticated farmer, but eventually becomes more refined and prosperous. Finally, in the later prints as Napoleon began losing both battles and popular support, Death becomes his constant companion and he is often associated with the Devil.